A Ballycastle councillor who was at the centre of a flare-up during a controversial incident at a Twelfth of July parade in the town has received a suspended jail term. Padraig McShane, (45), an Independent member of Causeway Coast & Glens Borough Council, appeared in the dock at Ballymena Magistrates Court on Wednesday and was given six months in prison, suspended for three years. The court heard he was involved in a confrontation with Dervock Young Defenders Band during the return leg of the July 12, 2016, parade in Ballycastle. During the incident, he assaulted a police officer and ended up on the ground before being arrested. Video footage from the day, which was posted widely on social media, showed blood on the councillor’s head. The councillor, a former member of Sinn Fein, had previously contested the charges but was convicted of assaulting and resisting the police officer and also disorderly behaviour. The councillor was also convicted of organising and taking part in a ‘protest meeting’ on the outward leg of the parade at Altnananam Park in Ballycastle. The charges stated that the requirements of the Public Processions Act had not been satisfied regarding notice of the ‘protest meeting’. Outlining the facts of the case, a prosecutor told Ballymena Court on Wednesday the councillor had a record but that no further offences had come to light. The prosecutor said at Altnananam Park, McShane had directed protesters onto a road and in the afternoon he was observed to be “aggressive and confrontational” with a band. The prosecutor said members of the band were also displaying signs of aggression and the councillor was “shouting and using foul language” before he pushed a police officer on the chest and landed on top of the constable on the ground. Defence barrister Mark Bassett said there had been a peaceful protest at Altnananam Park and the defendant had attended with the principle intention of observing the parade to see if the Parades Commission needed to be made aware of any matters of concern. The lawyer that the court had found the councillor had directed the protest. The barrister said there had been clear attempts by the councillor to remain separate from the group and although there had been “some heated words” with the police, on the whole, he had acted as a calming influence at the time. Regarding the later flare-up close to the Diamond in the centre of Ballycastle, Mr Bassett said McShane suffered a “loss of composure following significant provocation by members of the Dervock Band”. The barrister said members of the band were wearing face masks and individuals “may have been drunk”. Mr Bassett said the approach of the band’s banner to the councillor was “the trigger” and that the councillor had previously given evidence that he was spat at. 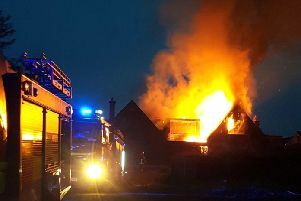 The barrister said there were insults and a reference was made to the councillor’s house being “burned down”. Mr Bassett said the councillor had a “long and admirable history of public service” and a very limited previous record. The lawyer said the councillor’s “public role led to his house being burned down”. And Mr Bassett said McShane’s convictions were likely to considered by the Local Government Commissioner for Standards and he could very possibly face censure. District Judge Peter King said the “ultimate censure” could come from the electorate. Sentencing the councillor, the judge said the incidents had dated back to 2016 and, thankfully, there had been nothing similar this summer. He said the defendant had been on bail since 2016 and said it was significant that since then there had been no further offending or issues with bail. However, he said the custody threshold had been crossed but he was going to suspend the sentence as he took into account there was a limited injury caused to the police officer who was assaulted. Imposing six months in prison, suspended for three years, the judge said had there been guilty pleas in the case he would have taken account of that. Bail of £500 was fixed for appeal against conviction and sentence. McShane left the court without making any comment to the media.